Want a light and easy way to get different looks out of your shoes? 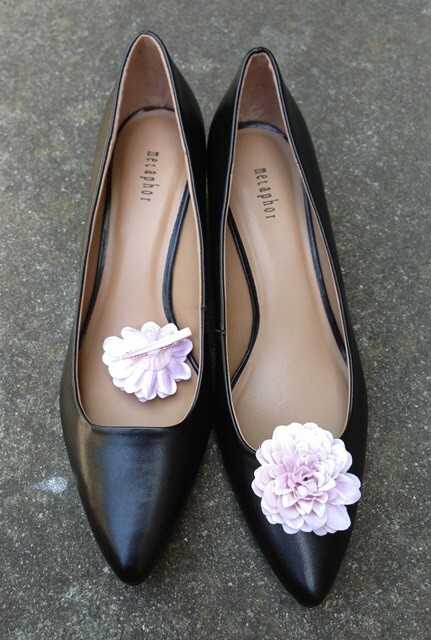 Consider using barrettes as inexpensive shoe clips. Alternatively, you can make your own shoe clips using clip-on earring backs, some decoration, and a bit of glue. Shoe clips work especially well during a dressy activity such as a cruise, where you want to get a lot of fancy looks out of just a few pieces of clothing. I pack the clips in the toe of the shoe to keep them from getting crushed during travel. I never thought of that one! You use soft ones I suppose?